Place It, Cut It, Piece It! Phenomenal new rulers, with extended corner channels, make squaring up quilt blocks simple and accurate. Visually center embroidery and applique designs before you cut. 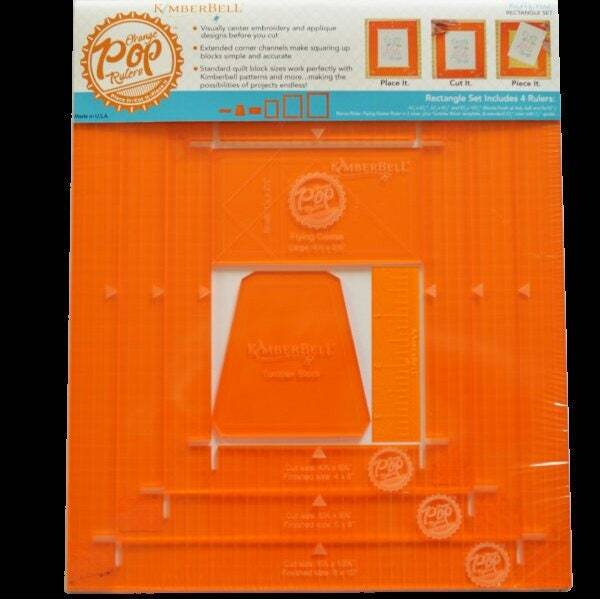 Orange Pop Rulers are fantastic for all types of quilt blocks—sewing or machine embroidery! The open frame allows you to not only see your block, but also keeps the ruler flat and level for precise cutting. No-slip grips on the back of the rulers prevents the tools from slipping while cutting. Square and rectangle sets coordinate with Kimberbell quilt patterns for Hello Sunshine, Jingle All the Way, Broomhilda’s Bakery, and so much more! Your projects will pop!